Don't forget! We have a *another* contest going besides our MGS 'stache. Reader Letsan didn't forget, writing: "There's only one Dragon Ball for three reasons: I was too lazy to make more of them, winter has my hands colder than the Balls itself, and there is no more orange juice. And they're made out of frozen orange juice, while the little star was cut down from a rubber keychain. Almost forgot to thank Maglite for that nice Dragon Ball glow!" To bring everyone up to speed: Make a Dragon Ball. The best damn Dragon Ball you can! It cannot be drawn or virtual — it must be an actual three dimension Dragon Balls. Now! If you don't know what Dragon Balls look like, you can click here. While the Dragon Balls you make should look like actual Dragon Balls, feel free to get creative with what you use to make them. The contest wraps up later this month. The finalists will win either the PS3 version or Xbox 360 version of Dragon Ball Z Burst Limit. 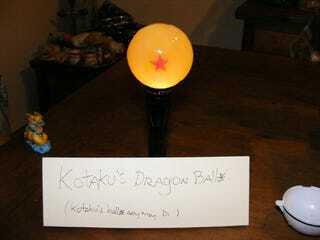 Be sure to send entries to kotakucontestATgmailDOTcom and include a Kotaku sign. Losers get INTERNET FAME. Hit the jump for more balls. Mojotroll writes, "I emptied a snow globe and then filled it with a clear epoxy resin that I dyed orange. Once the resin hardened I added a light bulb to the inside of the base to make it light up." Reader André sent these along. Tasty!